Review: Pat Solatano has lost everything. This includes his house, job and his wife. He finds himself living back home with his parents. Just come out of a stint in a mental institution. Pat meets a mysterious girl named Tiffany who has got problems of her own. Things start to get a bit complicated. 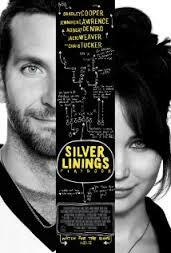 This is my best film that David O.Russell has directed. One of my favorite films of 2012. Very witty, funny and a film that can make you cry. It has got everything you need in it. The cast in this was really well chosen. Bradley Cooper and Jennifer Lawrence you can see straight away how well they get on with each other. They both spent weeks practising for the climactic ballroom dance routine with a choreographer. Anne Hathaway was cast but dropped out due to scheduling conflicts. Excellent performance from Robert De Niro. At the Academy Awards in 2013 it won one Oscar and that was for Best Performance by an Actress in a Leading Role (Jennifer Lawrence). Also in 2013 at the Golden Globe Awards it won Best Performance by an Actress in a Motion Picture – Comedy or Musical (Jennifer Lawrence). At the Bafta Awards the same year it won Best Adapted Screenplay (David O.Russell).